There are 5 big news for beauty GWP and limited edition beauty box. 1 Cult Beauty UK x Wayne Goss Beauty Box is coming. 2 Clinique Bonus 7Pc Gift at Saks Fifth Avenue Worth $127 plus step-up gifts. 3 Spring 2019 Estee Lauder GWP at Stage Stores. 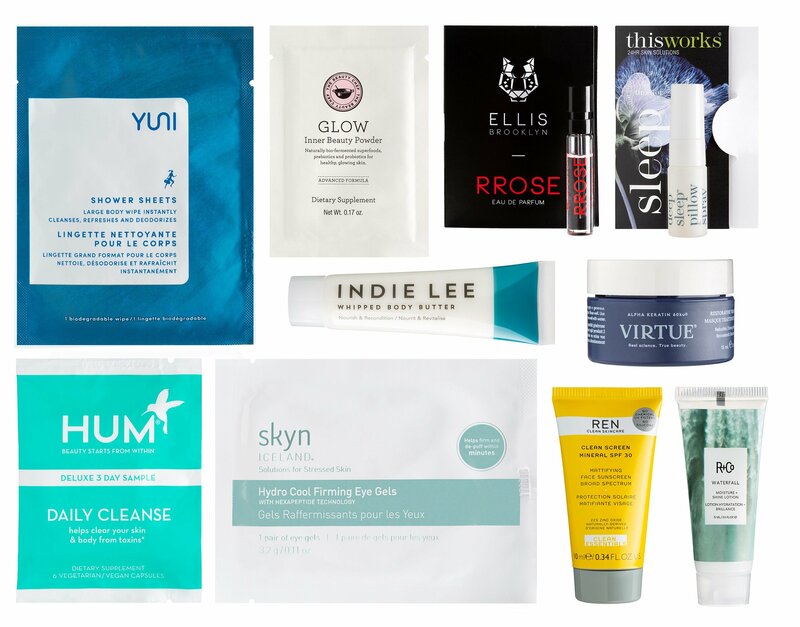 4 Sephora 5 wellness samples with $25 purchase and 5 Bluemercury is offering two beauty sample bags to choose from for free with any $125 purchase! Clinique bonus time at Saks Fifth Avenue Saks Fifth Avenue (NEW) GIFT 1: Receive a 7-pc gift with any $40 Clinique purchase use coupon code “CLINIQ7SF”, a $127 value. This post may contain affiliate links. Read the full disclosure. Nordstrom is offering two beauty sample bags at their spring beauty event and today they just added a new 10-piece Clinique gift with purchase and another step-up gift for sitewide purchase! Also, there are new sample bags at Macy’s and Ulta plus today’s gift with purchase round-up! NORDSTROM (NEW) GIFT 1: Receive a cosmetics bag and deluxe samples of Pop Lip Color + Primer in Blush Pop (0.08 oz. ), Moisture Surge 72-Hour Auto-Replenishing Hydrator (0.24 oz. ), Pep-Start Eye Cream (0.1 oz.) and Moisture Surge Hydrating Supercharged Concentrate (0.5 oz. ), plus a single-use Clinique iD: Dramatically Different Hydrating Jelly + Concentrate, with your $40 Clinique purchase. This post may contain affiliate links. Read the full disclosure. Natural beauty fans, feelunique launches a new Clean Beauty Edit Kit! Plus, Clinique Bonus at Belk, Elizabeth Arden GWP at Boscov’s, Sephora Favorites Wellness Kit, Canada Lancome GWP and more. FeelUnique US (NEW) Clean Beauty Edit Powered by Feelunique £39. (Value £104.10). This post may contain affiliate links. Read the full disclosure. Oh yes, there are three big GWPs from Clinique, Lancome and Estee Lauder for spring 2019 today! Plus, I’ve rounded up hot beauty GWP for you today. Macy’s (NEW) GIFT 1: Free 7-piece gift with any $29 Clinique purchase. Get an exclusive bag and five Clinique cult Classes. Complete your 7-piece gift with a full-size of our signature moisturizer. A $93 value. Gift Includes: This post may contain affiliate links. Read the full disclosure. There are five big gift with purchase offers and limited edition beauty box today — Violet Grey beauty box worth $400 (no sub), Clinique Bonus Time at Boscov’s and Dillard’s Spring 2019. Elizabeth Arden spring gift with purchase at Lord + Taylor, Lancome GWP at Von Maur. Dillard’s (NEW) GIFT 1: Receive a free 7-piece gift with any Clinique purchase of $29 or more. A $100 value. This post may contain affiliate links. Read the full disclosure. Everyone, it’s Spring Clinique Bonus Gift 2019 at Bloomingdale’s! There are two new Valentine’s Day Beauty Boxes at Beauty Expert and Lookfantastic plus, new Too Faced Valentine’s Day gift and Too faced mystery kit! Bloomingdales (NEW) GIFT 1: Receive a 7-piece gift with any $29 Clinique purchase (a $100 value). This post may contain affiliate links. Read the full disclosure. It’s Clinique Bonus Time 2019 at Belk + 15% off all Clinique! Nordstrom has a new beauty gift bag with $25 purchase and more Superbowl deals! Belk (NEW) FREE 7-PIECE GIFT* with any $29 Clinique purchase. Choose your fan favorite deluxe cleanser! A $90 value. This post may contain affiliate links. Read the full disclosure. RUN! Nordstrom has a decent Clinique gift that is better than Clinique bonus time available now Jan 2019 only plus GWP updates today! NORDSTROM (NEW) GIFT 1: Receive a full-size Liquid Facial Soap Mild with any Clinique moisturizer (start from $12) purchase. This post may contain affiliate links. Read the full disclosure. Two beauty unboxing posts in the row because I’m the worst! Today I unbox Clinique samples from Nordstrom. This free gift with purchase features a curated collection of 5 new Clinique iD and Clinique Jelly. Fancy this super-generous sampling program at department stores like NORDSTROM? This post may contain affiliate links. Read the full disclosure. Macy’s x Elizabeth Arden gift with purchase 7pc with $37.50 purchase and Stage Stores x Clinique bonus time 6pc with $29 purchase available now. Plus, top five beauty GWP from Zoya, Saks Fifth Avenue, Clarisonic, Darphin and Walgreens! Macy’s (NEW) GIFT 1: Free 7 pc gift with $37.50 Elizabeth Arden purchase (A $106 Value!). Your gift includes: This post may contain affiliate links. Read the full disclosure.